Welcome to Derby Pond Services website. Highlighted are some examples of the high quality workmanship and services we have been providing to clients in Derbyshire and further afield since 1995. We provide a genuine, year round service by a reliable, highly skilled, uniformed and helpful team. 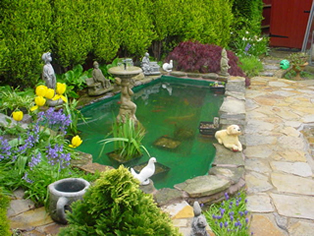 We are not only regarded as Derbyshire's most respected pond specialist company, we are also one of the most prolific, who take pride in the quality of our consultation, workmanship and aftersales services. 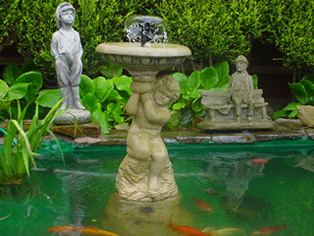 Your pond should be an asset to your garden and with the services we provide you can enjoy a beautiful pond thriving with aquatic and other wildlife without getting your hands wet! If you are experiencing problems with your pond, if it's in need of cleaning, repairing or a fantastic TV style makeover then we'll be delighted to help. We would be delighted to provide you with hand written refrences from customers upon request. For your peace of mind we are fully insured, details are available upon request. All staff are CSCS registered for site work.